This isn’t very well-known outside of Japan, but one day, while on a fishing trip, Shigesato Itoi visited a small curry shop near Mt. Fuji and was wowed by the curry they had there. His praise made the curry famous across the country, and thus “Itoriki Curry” was born, and an entire business built up around it apparently. Apparently this Itoriki Curry uses Japanese saké to get its good flavor. It’s so well-known that you can even order it online, through the restaurant directly or through places like Yahoo! Auctions Japan. The packaging for the packets is interesting. It uses a big hand-written message from Itoi about how good it is, when a good time to eat it is, and stuff like that. 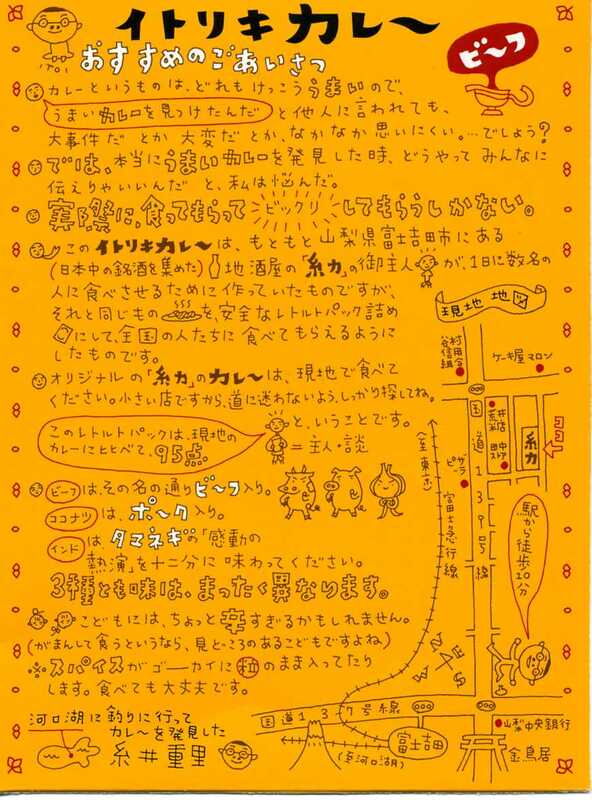 It also has plenty of his weird little drawings he likes to include with his messages like that. No Mr. Saturns or anything this time though. The curry comes in several different varieties, including coconut curry, Indian curry, beef curry. I LOVE curry. Gunna have to try some of this! Itoi joined their Curry for Critiques program, and provides them with handwritten notes for their packaging :P.
I’ve never had curry before but I’ve always wanted to try some. 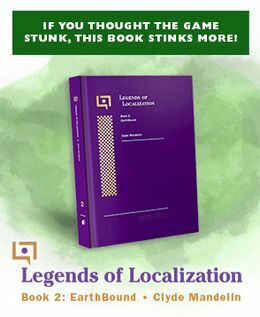 As soon as I get some money I think I’m gonna look into this – if Shigesato endorses it then it’s gotta be good in its own quirky ways. 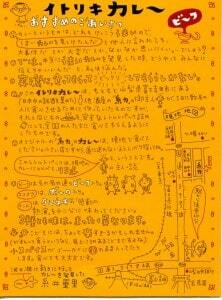 But I like Itoi’s note, especially the doodle of himself. Tongue is decent. It’s not my favourite thing, but it’s decent. Honestly, it doesn’t look as tongue-y as you’re probably thinking; beef tongues are gigantic, and you’ll certainly not be served the whole thing, so it really doesn’t look astonishingly different from any other piece of meat. I’d agree, beef tongue is delicious. HAVE YOU HAD CURRY TODAY? OH! IT MUST BE SEDGE! Meanwhile, on the subject of making sense, this is pretty cool. Next time I visit Japan, I’ll have to see if I can find one of the restaurants. I wish I could read that message. Is anyone willing to translate it? Aah, japanese style curry is the best! I make what I believe to be an accurate version, but I’d love to go to a restaurant and try authentic curry sometime. I gotta say, I’ve never had curry. “Curry” is actually a slightly confusing term, since there are tons of different varieties, usually by region. Indian curry is what people traditionally think of as “curry,” due to its popularity in Britain following the colonisation of India. Thai curry is a completely different dish, and Japanese curry is different yet again. Even within the different regional varieties, there are many, many different kinds, made with different spices and/or sauces. There’s enough variation available that I expect one or another type of curry is probably right up your alley.